I started this blog as a place to share pieces of our newlywed life along the Midwest third coast. Mostly, it's personal, but I promise I'll try to be witty. This week I experimented with a new recipe I found online at SkinnyTaste.com – and it turned out excellent! You can find their recipe here, but I’ll share how I modified it below! As it turns out, when you purchase a Midcentury Modern era house but don’t necessarily want floor to ceiling MCM decor, you spend 99% of your design time finding ways to blend. Don’t hassle me, I’m renovating. 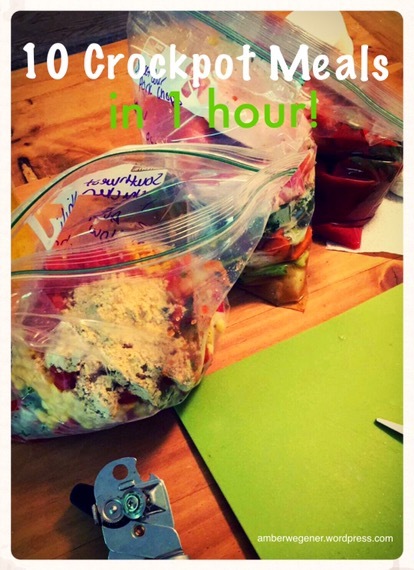 10 Crockpot Freezer Meals in 1 Hour!